MicroRNAs (miRNAs) are a class of small endogenous noncoding RNAs that play a crucial role in the posttranscriptional regulation of genes. Some miRNAs regulate cell proliferation and apoptosis processes, which are important in cancer formation and progression, by targeting oncogenes and tumor suppressor genes. These miRNAs function as oncogenes or tumor suppressors and thus named Oncomir and tumor suppressor miRNA, respectively. Recent studies have been shown that some miRNAs play important roles as tumor suppressors or oncogenes in different cancers such as gastric cancer. Liu et al. found that the expression profile of miRNAs was changed in MKN-45-derived cancer stem-like cells (CSLCs) relative to the MKN-45 cells. Cancer stem cells (CSCs) are defined as the unique subpopulation in the tumors that can initiate tumor formation. They have self-renew potency and can also differentiate into various kinds of cells. CSCs also induce the growth, metastasis, and chemo- and radio-resistant of tumors. In this regard, it has also been found that miRNAs have a crucial role in the function of CSCs through regulating the expression of different genes involved in the CSC characteristics and functions. Ibuprofen is a member of nonsteroidal anti-inflammatory drugs derived from propionic acid and is a nonselective inhibitor of COX, an enzyme involved in prostaglandin synthesis through the arachidonic acid pathway. Indeed, ibuprofen inhibits hydrophobic channel isozyme COX through direct interaction with the channel., COX is a key enzyme for conversion of arachidonic acid to prostaglandins and has two isozymes COX-1 and COX-2. It has been found that overexpression of COX-2 in cancer cell lines promotes their ability to invade surrounding tissues as well as increases cell invasion in gastric cancer. Ibuprofen inactivates COX-2 and thereby inhibits cancer cell proliferation. It is also able to induce apoptosis in cancerous cells and to inhibit angiogenesis in gastric cancer., Although the exact mechanism of action of ibuprofen is remained to be clarified, it found that oncomir and tumor suppressor miRNA expression was changed in the ibuprofen-treated CSCs. For example, ibuprofen delays the development of tactile allodynia and suppresses spinal miR-155 in a rat model. It showed that some miRNAs downregulated the expression of Cox-1 and Cox-2 genes and thereby inhibited cell invasion. For example, COX-2 is a target of hsa-mir-16 in human hepatoma. Given the importance of ibuprofen in regulating the expression of miRNAs in cells, this study was aimed to find miRNAs that target Cox-1/ 2 mRNA and to evaluate the effect of ibuprofen on the expression of the miRNAs in MKN-45-derived CSLCs. As well as, it was attempted to identify the signaling pathways that modulated by the miRNAs. In the current study, bioinformatic analysis was performed to find miRNAs that target Cox-1/ 2 mRNA. 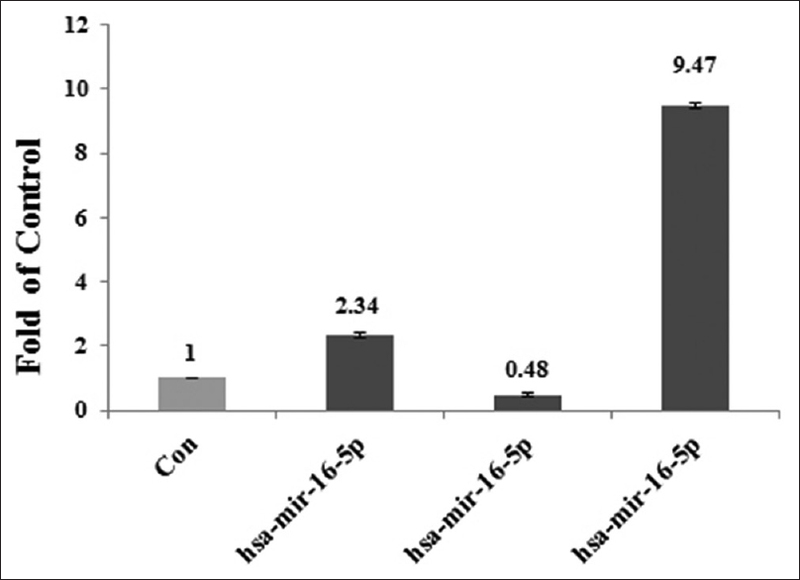 Consequently, we selected hsa-mir-16-5p, hsa-mir-4669, and hsa-mir-483-5p and then studied the effect of ibuprofen on the expression of these miRNAs in MKN-45-derived CSLCs. Finally, bioinformatic investigation was used to identify the signaling pathways that affected by these miRNAs. In the current study, different online databases were used to recognize miRNAs that target Cox-1/ 2 mRNAs and to find the signaling pathways that affected by the identified miRNAs. We used miRWalk, microT4, miRmap, PITA, RNA 22, TargetScan, and RNA hybrid in the miRWalk database (http://zmf.umm.uni-heidelberg.de/apps/zmf/mirwalk2/) to identify miRNAs that target Cox-1/ 2 mRNAs. The results were filtered and miRNAs with P ≤ 0.05 were selected from the list. After miRNA selection, the signaling pathways that affected by the selected miRNAs were obtained using DIANA tools (http://diana.imis.athena-innovation.gr/DianaTools). The MKN-45 cell line was obtained from Pastor Institute (Tehran, Iran) and cultured in Dulbecco's modified Eagle medium/F12 supplemented with 10% fetal bovine serum (Gibco, Germany), penicillin (100 U/mL), and streptomycin 100 μg/mL (Sigma, Germany). To isolate CSLCs, the MKN-45 cells were cultured on the nonadhesive surface of 10 cm 2 culture plastic dishes coated with agarose (1.5%) (Sigma, Germany) and incubated at 37°C and 5% CO2 for 2 weeks. The culture medium was changed every 3 days until the sphere formation, which was the indication for the presence of CSLCs in culture. To investigate the effect of ibuprofen on the expression of miRNAs in the MKN-45-derived CSLCs, they were treated with 700 μM of the compound. The ibuprofen-treated CSLCs were then incubated at 37°C and 5% CO2 for 48 h.
Total RNA was extracted from ibuprofen-treated and untreated CSLCs using a Qiagen RNeasy Mini Kit (Qiagen, USA) according to the manufacturer's instructions. Reverse transcriptase reactions were performed by specific stem-loop RT primer, including 5'-GTCGTATCCAGTGCAGGGTCCGA GGTATTCGCACTGGATACGACCGCCAA-3', 5'-GTCGTATCCAGTGCAGGGTCCGAGGT ATTCGCACTGGATACGACCTCCCT-3', and 5'-G TCGTATCCAGTGCAGGGTCCGAGGTATTCGC ACTGGATACGACCCTCCT-3' for hsa-mir-16-5p, hsa-mir-483-5p, and hsa-mir-4669, respectively. The effect of ibuprofen on the expression of miRNAs was evaluated using specific primers in quantitative real-time polymerase chain reaction (qRT-PCR). The nucleotide sequences of the forward primers were 5'-CGCGCTAGCAGCACGTAAAT-3', 5'-GTGCGTAAGACGGGAGGAAAGA-3', and 5'-C GCATAGTCCGGGAAGTGGAG-3' for hsa-mir- 16-5p, hsa-mir-483-5p, and hsa-mir-4669, respectively. In addition, a reverse universal primer contained 5'-GTGCAGGGTCCGAGGT-3' nucleotide sequence was used for all miRNAs. 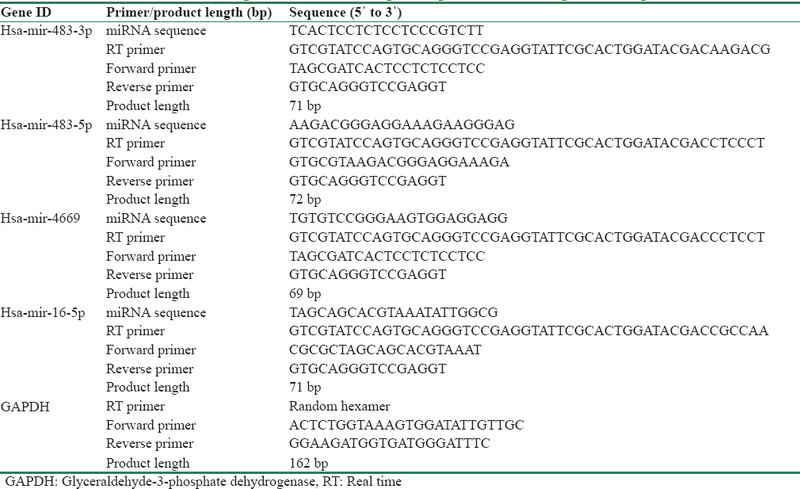 In this study, glyceraldehyde-3-phosphate dehydrogenase (forward primer: 5'-ACTCTGGTAAAGTGGATATTGTTGC-3' and reverse primer: 5'-GGAAGATGGTGATGGGATTTC-3') was also used as an endogenous control for relative quantification of gene expression by RT-PCR [Table 1]. In this study, the expression level of miRNAs relative to the internal control was assessed using Livak et al. method. In the present study, statistical analysis was performed using SPSS software (version 16.0) through a Student's t-test. Data were presented as mean ± standard deviation and P value cutoffs <0.05 were used to identify statistically significant data. CSLCs were derived from gastric cell line MKN-45 during 2 weeks after cells seeded on nonadhesive agarose-coated plastic dishes. 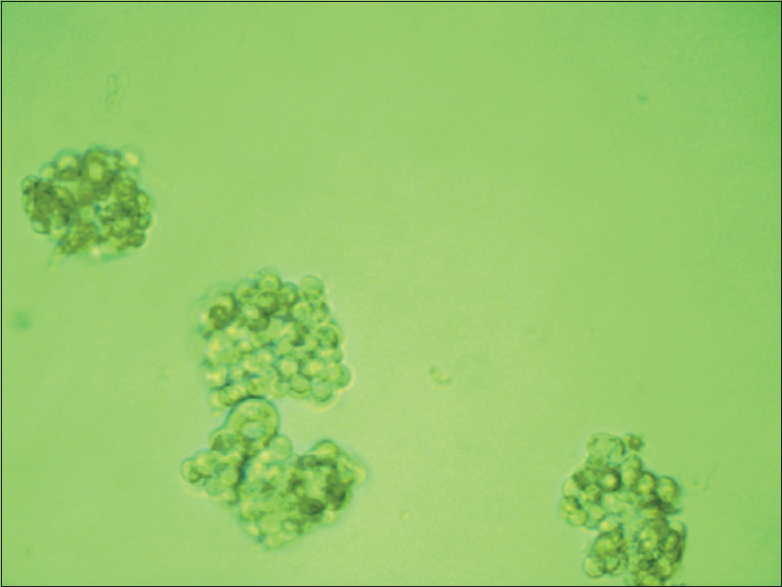 This culture condition was prevented MKN-45 from adhering to the dish surface and led to producing spheroid body-forming cells, which also known as CSLCs [Figure 1]. Consequently, the produced CSLCs were treated with ibuprofen. Our bioinformatic analysis showed that hsa-mir-16-5p, hsa-mir-483-5p, and hsa-mir-4669 targeted both Cox-1 and Cox-2 mRNAs (P ≤ 0.05). Results were shown in [Table 2]. Finally, hsa-mir-16-5p, hsa-mir-483-5p, and hsa-mir-4669 were selected to investigate the effect of ibuprofen on the expression of miRNAs in MKN-45-derived CSLCs. qRT-PCR was performed to evaluate the effect of ibuprofen on the expression of hsa-mir-16-5p, hsa-mir-483-5p, and hsa-mir-4669 in CSLCs [Figure 2]. The qRT-PCR results indicated that hsa-mir-16-5p and hsa-mir-4669 were upregulated 2.34 and 9.47 folds, respectively, whereas hsa-mir-483-5p (2.08 folds) underexpressed in ibuprofen-treated CSLCs relative to untreated cells [Figure 3]. 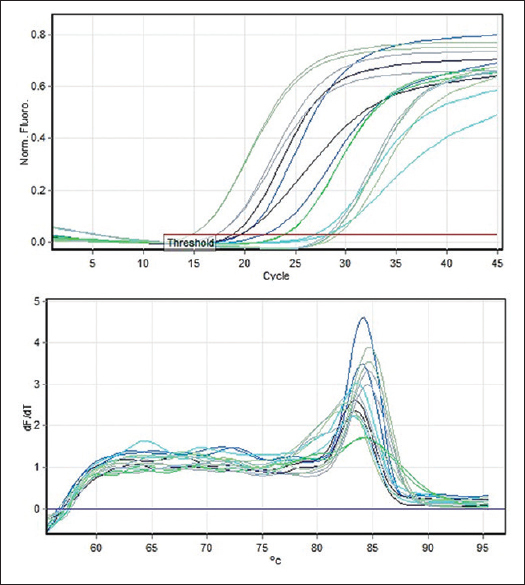 We used DIANA tools to identify signaling pathways influencing by hsa-mir-16-5p, hsa-mir-483-5p, and hsa-mir-4669. Results indicated that hsa-mir-16-5p was associated with PI3K-Akt, p53, mammalian target of rapamycin (mTOR), transforming growth factor-beta (TGF-β) and ErbB signaling pathways, cell cycle, small-cell lung cancer, and prostate cancer. Moreover, we found that hsa-mir-483-5p is related to PI3K-Akt signaling pathway, focal adhesion, extracellular matrix (ECM)-receptor interaction, gap junction, and prostate cancer. In addition, bioinformatic investigation showed that hsa-mir-4669 probably modulates phosphatidylinositol signaling system, insulin signal transduction, and chronic myeloid leukemia. miRNAs are a class of ~22-nt endogenous noncoding small RNAs that are associated with the development and progression of a variety of human cancers such as gastric cancer. It has been found that the expression profile of miRNAs in tumor initiation cells, CSCs, has differed from that in noncancerous cells. In addition, Chemical compounds, such as Ibuprofen, by targeting of effectors-mediated signaling pathways, influence on proliferation, differentiation and apoptosis of CSCs, and thus act as anti-cancer drug. Ibuprofen is a member of nonsteroidal anti-inflammatory drugs that used as a potential antitumor drug. The effect of ibuprofen was investigated on cell proliferation, apoptosis, angiogenesis, and expression of stemness marker genes. Mechanistically, it showed that ibuprofen works through inhibiting the COX enzymes. Overexpression of COX-2 in cancer cell lines increased their ability to invade surrounding tissues. In addition, it promoted cell invasion in gastric cancer. Despite these studies, the exact mechanism of action of ibuprofen is unknown, and therefore, this study was designed to detect miRNAs that target Cox-1/ 2 transcript and to find the signaling pathways associated with the identified miRNAs. In this regard, our bioinformatic investigation indicated that hsa-mir-16-5p, hsa-mir-483-5p, and hsa-mir-4669 posttranscriptionally modulate the expression of Cox-1/ 2 genes. Therefore, we evaluated the effect of ibuprofen on the expression of hsa-mir-16-5p, hsa-mir-483-5p, and hsa-mir-4669 in MKN-45-derived CSLCs using qRT-PCR. The results of the quantitative gene expression analysis indicated that ibuprofen induced the expression of hsa-mir-16-5p and hsa-mir-4669, while it reduced the expression of hsa-mir-483-5p in CSLCs. Interestingly, the highest level of upregulation was seen for hsa-mir-4669 in ibuprofen-treated CSLCs (9.47 folds) as compared with untreated controls. A previous study by Liu et al. demonstrated that miR-4669 is one of the miRNAs that upregulated in the spheroid-forming cells as compared to the parental cell line MKN-45. Therefore, it is proposed that hsa-mir-4669 acts as a tumor suppressor miRNA. Collectively, our bioinformatic data and gene expression analysis indicated that ibuprofen may inhibit cancer initiation and progression through upregulation of hsa-mir-4669 and consequently downregulating the Cox-1/ 2 transcript. Moreover, bioinformatic investigation demonstrated that hsa-mir-4669 is related to regulation of the phosphatidylinositol and insulin signal transduction, and therefore, it proposes that hsa-mir-4669 may affect the CSLCs characteristics and functions through regulating these signaling pathways. hsa-mir-16-5p is a tumor suppressor miRNA and it has been reported that hsa-mir-16-5p was downregulated in non-small cell lung cancer. Our bioinformatic evaluation also showed that hsa-mir-16-5p is a potential regulator of Cox-1/ 2 expression, and thus, the effect of ibuprofen was assessed on the expression of mir-16-5p in the MKN-45-derived CSLCs. Results revealed that the expression of hsa-mir-16-5p was also upregulated 2.34 folds in ibuprofen-treated CSLCs as compared to untreated cells. Therefore, these data propose that ibuprofen probably affects CSLC biology through overexpression of hsa-mir-16-5p and downregulating the Cox-1/ 2 transcript. In addition, DIANA tools indicated that hsa-mir-16-5p modulates PI3K-Akt, p53, mTOR, TGF-β, and ErbB signaling pathways, and therefore, it can suggest that hsa-mir-16-5p probably influences on CSLC characteristics through regulating these signaling pathways. In the present study, we also found that hsa-mir-483-5p posttranscriptionally regulated the expression of Cox-1/ 2 genes. Functionally, a previous study indicated that hsa-mir-483-5p acts as tumor suppressor miRNAs and reduced cell proliferation in adrenocortical carcinoma cell lines. Hsa-mir-483-5p also suppresses cell proliferation through induction of G0/G1 arrest in glioma cells. Moreover, upregulation of hsa-mir-483-5p is associated with poorer disease-specific survival. According to the results of these studies, we expected that ibuprofen treatment upregulates hsa-mir-483-5p expression in CSLCs, but our findings revealed that the expression of hsa-mir-483-5p was decreased 2.08 folds in ibuprofen-treated CSLCs as compared to untreated samples. In addition, bioinformatic investigation showed that hsa-mir-483-5p is associated with PI3K-Akt signaling pathway, focal adhesion, gap junction, and ECM-receptor interaction. Therefore, we propose that ibuprofen may influence on the CSLC communications and interactions through downregulation of hsa-mir-483-5p. We deduce that ibuprofen may reduce the risk of gastric cancer through modulating the expression of hsa-mir-16-5p, hsa-mir-483-5p, and hsa-mir-4669 and thus by regulating Cox-1/ 2 expression and signaling pathways that are involved in cancer initiation and progression. However, the exact mechanism and the role of these regulations are needed to be elucidated in further study. We would like to acknowledge and extend our gratitude to Diba Farahani for her contribution in completing this work. Liao YL, Tsai KW, Lin WC. miRNAs in Gastric Cancer. Rijeka: INTECH Open Access Publisher; 2011. Liu J, Ma L, Wang Z, Wang L, Liu C, Chen R, et al. MicroRNA expression profile of gastric cancer stem cells in the MKN-45 cancer cell line. Acta Biochim Biophys Sin (Shanghai) 2014;46:92-9. Tan BT, Park CY, Ailles LE, Weissman IL. The cancer stem cell hypothesis: A work in progress. Lab Invest 2006;86:1203-7. Kim Y, Joo KM, Jin J, Nam DH. Cancer stem cells and their mechanism of chemo-radiation resistance. Int J Stem Cells 2009;2:109-14. DeSano JT, Xu L. MicroRNA regulation of cancer stem cells and therapeutic implications. AAPS J 2009;11:682-92. Prusakiewicz JJ, Duggan KC, Rouzer CA, Marnett LJ. Differential sensitivity and mechanism of inhibition of COX-2 oxygenation of arachidonic acid and 2-arachidonoylglycerol by ibuprofen and mefenamic acid. Biochemistry 2009;48:7353-5. Rao P, Knaus EE. Evolution of nonsteroidal anti-inflammatory drugs (NSAIDs): Cyclooxygenase (COX) inhibition and beyond. J Pharm Pharm Sci 2008;11:81s-110s. Hawkey CJ. COX-1 and COX-2 inhibitors. Best Pract Res Clin Gastroenterol 2001;15:801-20. Murata H, Kawano S, Tsuji S, Tsuji M, Sawaoka H, Kimura Y, et al. Cyclooxygenase-2 overexpression enhances lymphatic invasion and metastasis in human gastric carcinoma. Am J Gastroenterol 1999;94:451-5. Kerola M, Vuolteenaho K, Kosonen O, Kankaanranta H, Sarna S, Moilanen E, et al. Effects of nimesulide, acetylsalicylic acid, ibuprofen and nabumetone on cyclooxygenase-1- and cyclooxygenase-2-mediated prostanoid production in healthy volunteers ex vivo. Basic Clin Pharmacol Toxicol 2009;104:17-21. Akrami H, Aminzadeh S, Fallahi H. Inhibitory effect of ibuprofen on tumor survival and angiogenesis in gastric cancer cell. Tumour Biol 2015;36:3237-43. Mahmoodi F, Akrami H. Evaluate the inhibition effect of ibuprofen on metastasis and invasion in gastric cancer stem cells. Shahrekord Univ Med Sci J 2015;17:88-96. El-Lithy GM, El-Bakly WM, Matboli M, Abd-Alkhalek HA, Masoud SI, Hamza M, et al. Prophylactic L-arginine and ibuprofen delay the development of tactile allodynia and suppress spinal miR-155 in a rat model of diabetic neuropathy. Transl Res 2016;177:85-97. Cornett AL, Lutz CS. Regulation of COX-2 expression by miR-146a in lung cancer cells. RNA 2014;20:1419-30. Agra Andrieu N, Motiño O, Mayoral R, Llorente Izquierdo C, Fernández-Alvarez A, Boscá L, et al. Cyclooxygenase-2 is a target of microRNA-16 in human hepatoma cells. PLoS One 2012;7:e50935. Chen SF, Chang YC, Nieh S, Liu CL, Yang CY, Lin YS, et al. Nonadhesive culture system as a model of rapid sphere formation with cancer stem cell properties. PLoS One 2012;7:e31864. Fan L, Qi H, Teng J, Su B, Chen H, Wang C, et al. Identification of serum miRNAs by nano-quantum dots microarray as diagnostic biomarkers for early detection of non-small cell lung cancer. Tumour Biol 2016;37:7777-84. Özata DM, Caramuta S, Velázquez-Fernández D, Akçakaya P, Xie H, Höög A, et al. The role of microRNA deregulation in the pathogenesis of adrenocortical carcinoma. Endocr Relat Cancer 2011;18:643-55. Wang L, Shi M, Hou S, Ding B, Liu L, Ji X, et al. MiR-483-5p suppresses the proliferation of glioma cells via directly targeting ERK1. FEBS Lett 2012;586:1312-7. Soon PS, Tacon LJ, Gill AJ, Bambach CP, Sywak MS, Campbell PR, et al. MiR-195 and miR-483-5p identified as predictors of poor prognosis in adrenocortical cancer. Clin Cancer Res 2009;15:7684-92.